On April 3, Chinese Ambassador Jin Zhijian visited Husavik and met with Mr. Orlygur Orlygsson, president of Nordurthing’s town council and Ms.Drifa Valdimarsdottir, deputy mayor of Husavik. Ambassador Jin introduced the latest development of China and China-Iceland relations, and pointed out that the bilateral relations enjoyed new opportunities of development with local exchanges as one of the most promising fileds of cooperation. China attached great importance to the friendly exchanges and cooperation with Husavik, and would like to further discuss the possiblities of cooperation in trade and investment, tourism, arctic cooperation and cultural exchanges. The Chinese Embassy is willing to offer assistance to promote local exchanges between Husavik and China local governments for a win-win result. Mr. Orlygsson and Ms. Valdimarsdottir welcomed Ambassador Jin to visit Husavik. They introduced the history of Husavik as well as its latest economic and social development and future plan. They stressed taht Husavik was willing to further strengthen its cooperation with China and contribute to the promotion of bilateral relations. 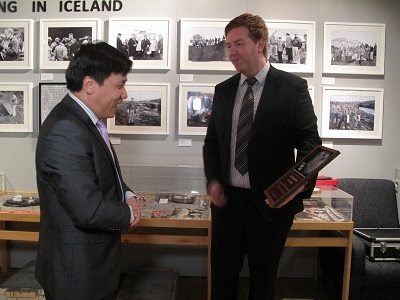 During the visit, Ambassador Jin is also accompanied by President Orlygsson to visit the Husavik Explore Museum.